Q: I have a crape myrtle and the tips of the leaves are turning brown. I have been told it is due to watering. Could this be causing it? A: When the tips of leaves brown, it is due to a form of stress. It can be caused by over or under watering. Excess salt can also cause this problem. Check the quality of the water and make sure the plant gets a good soaking once or twice a week. Q: The plants in my agapanthus bed are thriving and are thick and full. They seem to be flowering less than in the past. How do I go about reducing the number of plants? 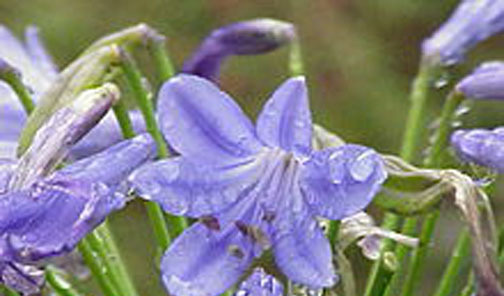 A: To thin the bed, simply dig up a clump of the agapanthus. Then you can split the clump or work each individual plant out from the clump. Some of these are reset into the bed while the excess is used to form new plantings or are discarded. Q: There are rust colored spots on the leaves of my agapanthus. There are more on the leaves this year than last. Do I need to control this and, if so, how? A: You can pick off the leaves if there are not too many that are diseased. A fungicide spray can be applied during times of high humidity. Do not over water the planting. The disease can cause the decline of the planting, if left unchecked, so try to get the problem under control.